The 63rd Karen State Day annual ceremony was held in Hpa-An on 7 November. 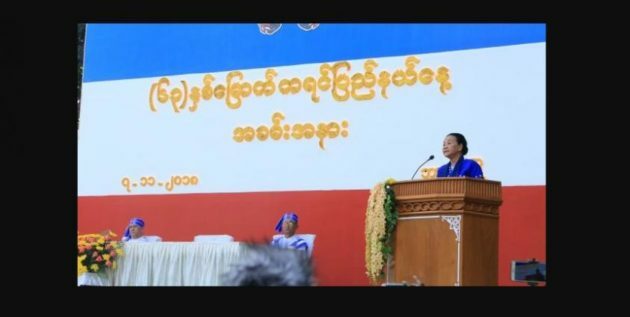 The event, which was run by the Karen State Government, was opened by U Aye Thar Aung, vice-chairman of the National Parliament. U Aye Thar Aung also made an inaugural speech at the ceremony. Present at the ceremony were Nai Thet Lwin (the Union Minister for Ethnic Affairs Ministry), Nan Khin Htwe Myint (Chief Minister of the Karen State), Ministers for Ethnic Affairs from Yangon, Bago, Tanintharyi and Mon states and the representatives from the Karen Revolutionary Armed Organizations. After the inauguration of the ceremony, the decorated entrance gate opening event was also continued and the authorities together with the public visitors went around the festival compound where Karen Cultural Display showroom, Peace-related presentation area and many more demonstration were set up. The event, which used to run until 11 November, includes games and various competitions such as traditional Don-dances, traditional boxing, cane-ball competition, tennis and golf playing contests, boat-rowing races, Misters and Misses body-beauty contests and various entertainments. The Karen State has been formed first step in the Salween District in accordance with the article 180(1) of the constitution. Then on 1st June 1954 and 1st July 1955, the linking constituencies of Hpa-an, Thandaunggyi, Hlaingbwe, Kyainseikgyi and Kawkareik districts were put under the Karen state administration. On 25th February 1955, the 14th Anniversary of the Karen State Council Conference acknowledged the Salween District as the Karen State and also marked the 7th November as the Karen State Day and the then President signed the document which accepted 7 November 1955 as the first ceremony of the Karen State Day.